John Malkovich, Coming To Terms With 'Disgrace' Renee Montagne talks with the actor about his part in the film of J.M. Coetzee's Booker Prize-winning novel, in which a scandal-mired South African academic retreats to his daughter's farm — where both brutal horror and a gritty kind of hope await him. Scandal-struck academic David Lurie (John Malkovich) is the protagonist in J.M. Coetzee's wrenching novel — now a film — of Afrikaners wrestling with both high hopes and bitter realities in the half-decade after the end of apartheid in South Africa. The actor John Malkovich, who has played all manner of morally compromised men — from the merely louche Vicomte de Valmont in Dangerous Liaisons to the outright murderous Tom Ripley in Ripley's Game — takes on another dubious character in the film adaption of J.M. Coetzee's novel Disgrace. The book, which won the Booker Prize in 1999, is a bleak depiction of post-apartheid South Africa. In the movie, Malkovich stars as David Lurie, a professor who loses his position in disgrace after an affair with a student goes sour. Well, in "disgrace," anyway. As Malkovich tells Renee Montagne, "Clearly [Lurie] rejects not just the politically correct mores about [his offense]; he really rejects the notion, it seems to me, that he did anything wrong." Malkovich says Coetzee offers one clue about why in his choice of a career for the professor: Until his downfall, Lurie teaches Romantic poetry. "Probably if you spend your whole life reading Byron and Keats and Shelley, partaking of their worldview, then you might have a different moral compass than those who don't." When David (Malkovich) and Lucy (Jessica Haines) are attacked by local youths, the aftermath strains their already troubled relationship — and their dealings with their black South African neighbors. Lurie retreats to South Africa's Eastern Cape region, where his daughter, Lucy (played by Jessica Haines), grows flowers and raises dogs on a farm. She runs it together with a black South African named Petrus (Eriq Ebouaney); once a field hand, Petrus has become Lucy's business partner — part of the new social reality in post-apartheid South Africa. Even in that hopeful new climate, however, rural South Africa can be a dangerous place. And yet Lurie finds his openhearted daughter living defiantly, refusing to live behind high walls or keep a gun for protection as many of her compatriots do. Lucy's choices don't sit easy with her father, who isn't nearly as optimistic as she chooses to be. "[Lurie] worries about his child's fate," Malkovich says, "and I think he sees this land being taken from her. I think he resents that." As it turns out, Lurie's worst fears come to pass. Lucy is gang-raped; David, viciously beaten and burned. Yet Lucy insists on staying on the farm, choosing to rebuild a life that includes Petrus — even though he turns out to be sheltering one of her attackers. It's a decision David can neither understand nor abide, and it strains their already fragile relationship. "But what also happens is that Lucy makes — no, she doesn't make peace with it, because I don't think it's something you make peace with," Malkovich says. "She endures what happens to her in the hopes that the future will be better." David, too, finds something to carry into the future: He learns what Malkovich chooses to think of as "acceptance." 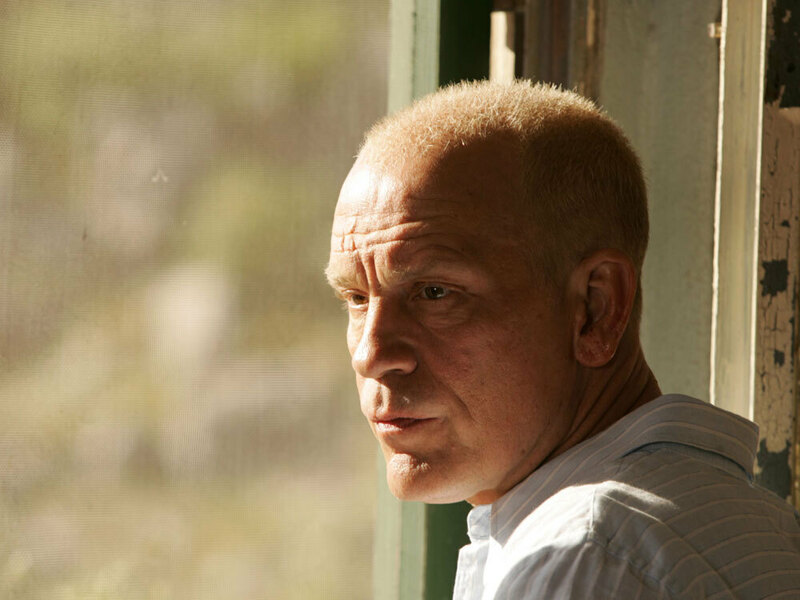 And as the movie ends, the camera pulls back on a vision of the universe Malkovich's character has come to accept: a tidy farmhouse, vulnerable and very small, in the vast, wild landscape of South Africa.